It’s vogue in many offices to add a short motivational quote under your signature line to inspire others (or to hint that you are inspired), but how do you pick them and how often do you change your mantra? Is it constantly changing to reflect the flavor of the day, borrowed from a quick Google search or a quotation desk calendar, or lifted from collection of fortune cookie slips? If so, you’re missing an opportunity to share your world view or personal philosophy. Let’s take a step back and think about this seemingly simple, almost mundane search for a good quote. What really matters to you? “Don’t cry because it’s over. Smile because it happened,” attributed to Dr. Suess. This perspective was helpful after we unexpectedly lost our boy Bailey last summer, a beautiful golden Pomeranian who’d been in our family for 10 years. The sentiment also has been of great comfort to me when dealing with the grief of family deaths, or when we’ve moved from a beloved area to another home or location. “Sometimes the easiest way to solve a problem is to stop participating in the problem,” noted Jonathan Mead. This is so obvious, and yet one of the hardest lessons I’ve learned over the years. It works! When you take yourself out of a problem situation, you’re more able to invest time in a solution. “When you complain, you make yourself a victim. Leave the situation, change the situation, or accept it. All else is madness,” attributed to Eckhart Tolle. I try to be tolerant, as a listener and friend, to hearing the same complaint from someone three times before throwing out this quote. Likewise, I give myself three chances to make a choice – and then stick to it, even when it means accepting something I don’t like. It saves countless hours of regret and/or whining. “If you want to build a ship, don’t drum up the men to gather wood, divide the work and give orders. Instead, teach them to yearn for the vast and endless sea”, attributed to Antoine de Saint-Exupery. Luckily, I found this while charged with managing talented people, and I made it a mission thereafter to share my love of the work itself. It was so much easier, then, to reach the outcomes we all wanted to achieve as a result of our shared passion. “When I do good, I feel good. When I do bad, I feel bad. That’s my religion,” said Abraham Lincoln. I admit to having Abe’s answer when asked about my religious affinity. I do belong to a faith denomination and perspective, but this explains my faith base far better than any denominational label. 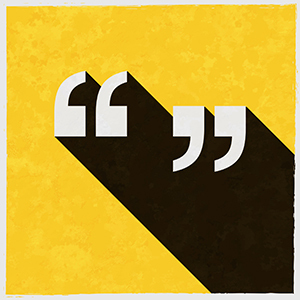 If you haven’t memorized quotes that matter to you, here’s a quick way to find one that might speak to your experiences or heart. Write down the traits you most admire or want to encourage in yourself or others. Honesty? Good parenting? Justice? Promoting world peace? Encouraging diversity? Now you have something specific to feed to BrainyQuote instead of “inspirational quote.” That P.S. line under your name is now a Personal Statement rather than an inconsequential add-on.